It this not one of the most adorable collections for any camping lover out there?!? This collection is called "Roughing it" by Laurie Wisbrun. You can find it in either Nature or Retro. I personally love the "Nature" colorway. There are so many cute things that you can make with this collection. You could make matching pajama bottoms for the whole family to wear while sitting around the campfire, or even make a lovely quilt to cuddle up with while you are sleeping in your camper or tent. I think this is a must have for any outdoor camping family. I am a big fan of Julie's I think she has great taste in the collections she picks out for her shop. Stop by her shop to see all the beautiful collections that fill her store. 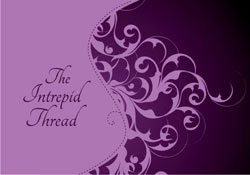 The Intrepid Thread is not only an online store. If you live in Milpitas, CA area you can visit her brick and mortar store as well. You can also follow Julie on her Blog or on her Facebook Fan Page.